Ninja Baby moves along on pure adorableness. Nina enters the world in dramatic fashion. Trying to get her to take a first breathe, her doctor pats her bottom . . . and then tumbles backward thanks to Nina’s karate chop. Nina loves to do things by herself. She high kicks her way through life, balances like a true ninja, and never gives the idea of family much thought, until . . . her parents arrive home with a baby boy—a Kung Fu Master. This Kung Fu Master knows how to get attention and doesn’t do a thing for himself. Nina now wants her parents’ attention. Goode’s pen, ink, and watercolor illustrations deftly show Nina’s ninja movements and facial expressions, using sly humor and making great use of white space. Zeltser’s witty story contains perfect timing and a fun twist at the end. Sibling-rivalry has never had so much heart as in Ninja Baby. I love the dichotomy between the siblings. One—Ninja Baby—trained in combat and espionage. The other—Kung Fu Master—trained in suppressing attackers. The Kung Fu Master, using his smile and adorable gurgling effervescence, effectively suppresses his Ninja sister. The two join forces, learning from the other. They make an adorable team and are probably more than a handful for their parents, who do not stand a chance. Or do they? Ninja Baby is perfect for new parents and parents-to-be with other small children. Okay, Ninja Baby is perfect for any parent, perfect for storytime, and perfect for bedtime. 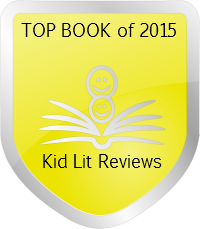 Young children will love the humor and the wonderful illustrations. Ninja Baby is smart storytelling. The illustrations enhance the story three-fold: detailed expressions, martial art positioning, and the aforementioned smart use of white space. Ninja Baby will disarm those who read this interesting and intelligent picture book. NINJA BABY. Text copyright © 2014 by David Zeltser. Illustrations copyright © 2015 by Diane Goode. Reproduced by permission of the publisher, Chronicle Books, San Francisco, CA. Purchase Ninja Baby at Amazon —Book Depository—IndieBound Books—Chronicle Books. Learn more about Ninja Baby HERE. 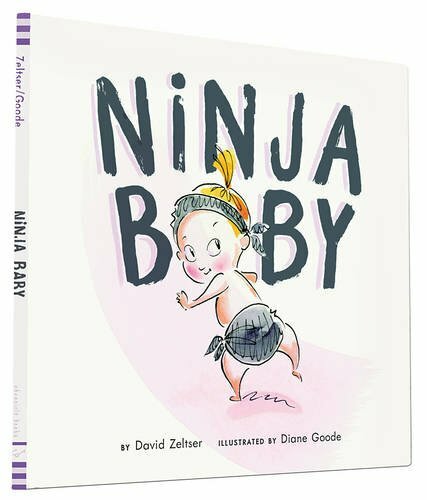 NINJA BABY by David Zeltser. Illustrations © 2015 by Diane Goode. Used by permission of Chronicle Books. Love this book’s premise. Can’t get enough of the power of ninjas. It seems to be a popular trend. Another great 6 star review, Sue! This looks fantastic. But, dang, every other PB out there is about ninjas! Ninjas and dragons are “it” this year. And last. And maybe next year, too. Ninjas and KungFu guys can be scary. I’m glad these two are cute! The get along. It’s the parents that are scary — that’s the twist. This looks super cute, Sue. Love the illustrations. The illustrations are adorable. The above images don’t do them justice.